Preheat oven to 350° F. Prepare 9 inch round cake pan with floured baking spray. Prepare cake batter according to package direction. Bake cake as directed. 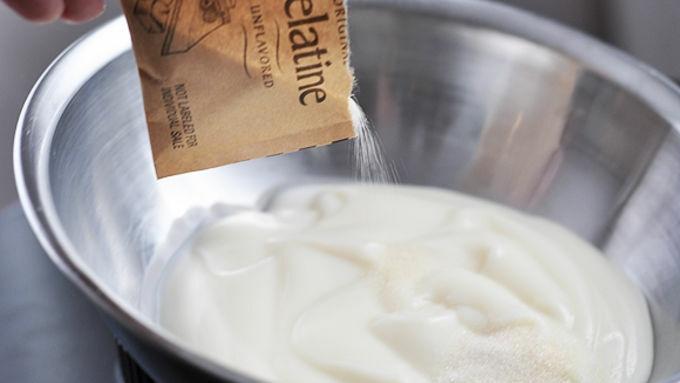 While cake is baking, pour yogurt into a small bowl. Add gelatin and whisk to incorporate thoroughly. Cover yogurt mixture and refrigerate. When cake is done, remove it from the pan and set on a cooling rack until completely cooled. With a sharp serrated knife (like a bread knife), cut cake in half horizontally to make two layers. Place the bottom layer on a cake plate with inside of cake face up. Spread yogurt mixture over bottom cake layer. (Use just enough to make a good layer, but not so much that it overflows the sides.) Place top cake layer over the yogurt, with inside of cake face down. Spoon hot fudge topping over top, spreading just to the edge of the cake. For garnish (optional), heat 1/4 cup white chocolate baking chips in a small microwave-safe bowl for 30 seconds. Remove and stir until smooth. (Return to microwave for a few more seconds, if necessary, until chips can be stirred smooth and are drizzling consistency.) Drizzle over hot fudge layer. Refrigerate cake one hour and slice with a sharp knife. 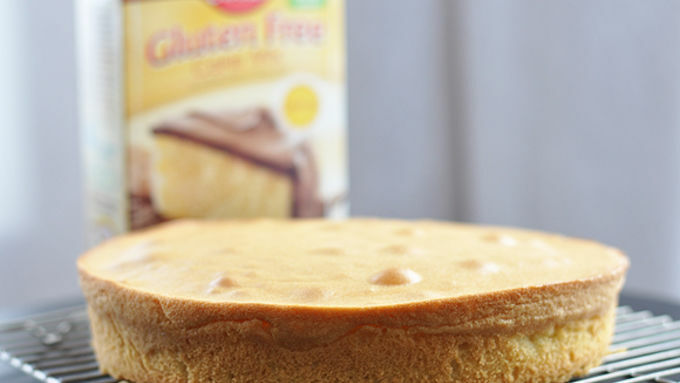 To make this cake entirely gluten free, check labels of products used. The cake mix and yogurt are gluten free. Gluten-free options for unflavored gelatin, hot fudge topping and white chocolate chips are widely available. Internet resources can confirm gluten-free status of many foods, too. Why's it called pie when it's really cake? Who knows. 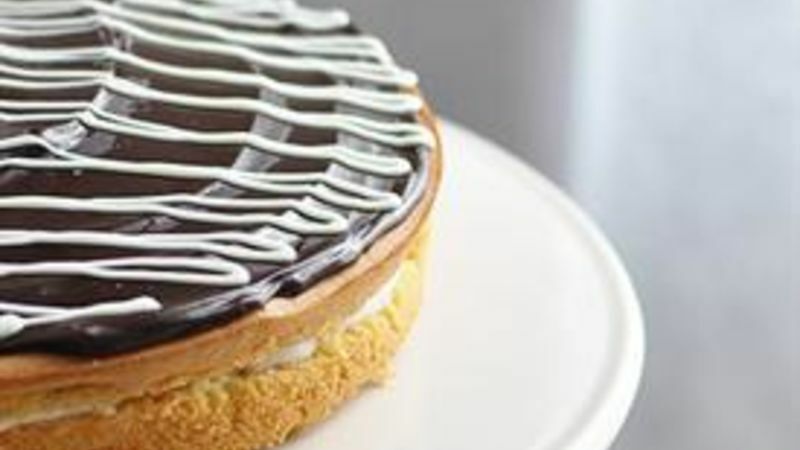 But if you're a Boston Cream Pie fan, you don't care what it's called. You just want to stuff it in your face. 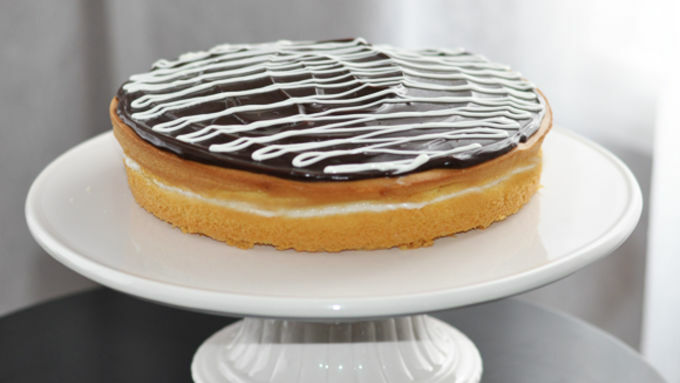 How about making a Boston Cream Pie the easy way -- with a bunch of stuff you can grab off the shelf at the grocery store and throw together fast? And what if, instead of sinful custard filling, you used creamy yogurt instead? I just may have invented a better mousetrap ... especially for anybody with a gluten-free sweet tooth. Start with a Betty Crocker Gluten Free Yellow Cake Mix. Why gluten free cake mix? 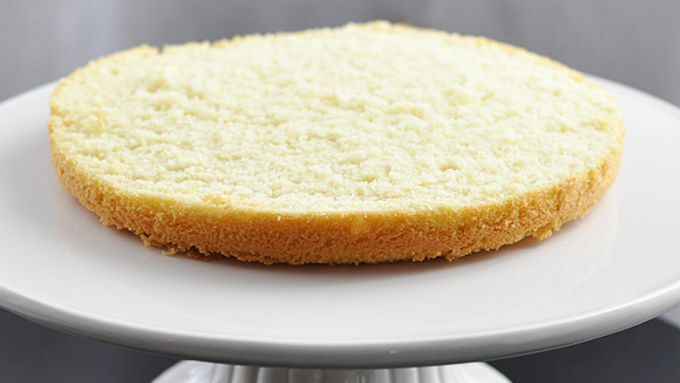 It makes a single round cake that's just the size and density that resembles made-from-scratch sponge cake. And, duh, it's gluten free. If you wanna get all fancy-schmancy like I did, melt 1/4 cup white chocolate chips in the micro a few secs and drizzle that over the top. You don't need to do this, but trust me -- this is biggo bang for the extra two minutes. Chill an hour in the fridge, then cut slices with a sharp knife. And there is just nothing more to say except -- chow down! 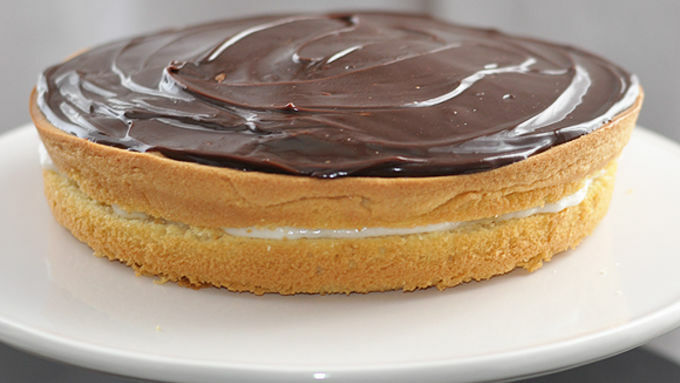 Gluten-Free To make this Boston Cream Pie gluten free, check the labels of all products used. The cake mix and yogurt are gluten free. Options for gluten-free unflavored gelatin, hot fudge ice cream topping and white chocolate chips are widely available. 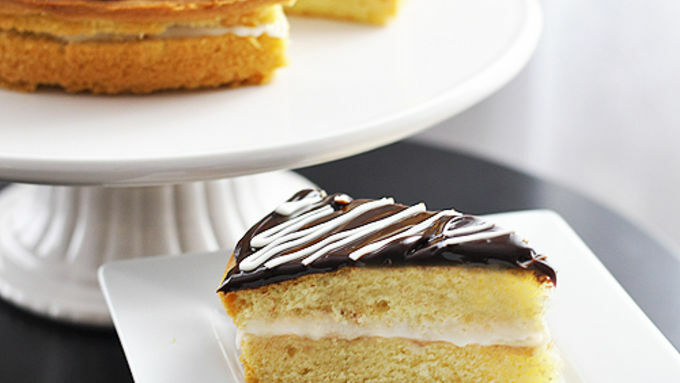 More Gluten-Free Goodies With these gluten-free treats, everyone can enjoy dessert!